Stampin' Up! ® has just had a major colour revamp, so to start off the new catalogue year at Colour INKspiration we've decided to feature a Colour Collection for the first challenge each month (2nd Wednesday) until we have showcased them all! The second challenge in the month (4th Wednesday) will be a Pinterest inspired pic as per usual just to mix it up a bit. This month we are starting off with the NEUTRALS COLLECTION and you can choose any 3 colours from that range for your challenge project. We are also changing the rules about what else you can add to the mix; essentially just the Basics - Whisper White, Very Vanilla and Basic Black as well as metallics. 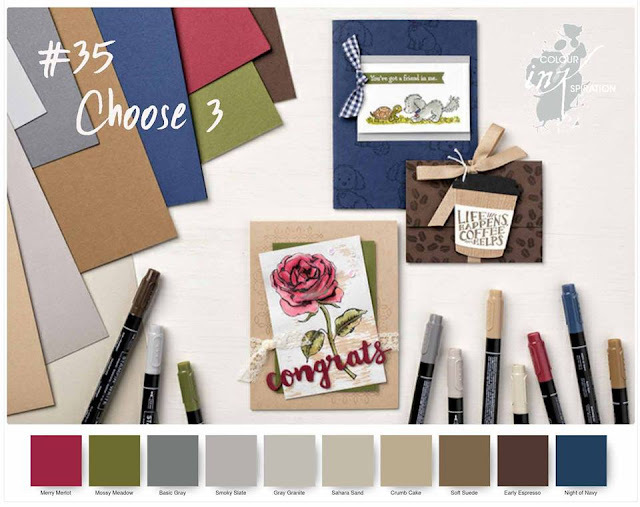 In their study of colour use SU noted that many crafters use Navy, Burgundy and a Deep Green in the same way that they use Neutrals so they included them in the family. This is great news for me- I never disposed of Mossy Meadow because I loved it so much, and Navy is always part of my Neutral scheme. And not only do I love to drink the odd glass of red wine I LOVE the new colour. So despite it seeming a simple thing to only choose 3 Neutral Colours, I have to admit that I have made more than one card for this week's blog. Initially I had 4 colours so I had to change it, then I created another card but it still wasn't quite right. So at the 11th hour I have created yet another version and happily it worked!! I have been wanting to play with this gorgeous new set- Serene Garden and the matching Garden Scene framelits.....and it is SO lovely to use and quite different. It was indeed a challenge. I LOVE Gray Granite and can see it becoming my go to neutral card base in place of Crumb Cake. It has a lovely warmth to it and is not too dark (like basic gray), or too light (like smoky slate. It won't take over the other colours but will show them off. The set comes with a large corner image as a stamp, and an embossing plate which has the exact same image, and a framelit which cuts out select leaves only from the image. It took a little bit of playing but in the end this was the process for this card. I stamped the 3 blossoms and watercoloured them using Merry Merlot,and cut them out using the framelits. I stamped off the large image twice before stamping the inside of the card. I embossed both the Gray Granite and the Merry Merlot piece using the new embossing mats. I can see it will take me a while before I remember the correct sandwich but I do love the effect. They give a very detailed impression. You can see the gorgeous veins on all those leaves. I used the framelits to cut out the Gray Granite piece. You can see it removes select leaves. I cut a corner frame from Merlot cardstock. I layered them all together and wrapped some very vanilla twine around the base - this was partly to cover some of the embossing outlines from the edge of the embossing plate. Layered this up on the vanilla card base. I painted the flowers, the leaves and some of the stems with my wink of Stella. I will post the pictures of the other cards I made using this colour scheme tomorrow! We'd love to see which 3 Neutral Colours you are going to play with this week and post to our Facebook page. But in the meantime be sure and hop all the way around the design team. There are some stunning projects.